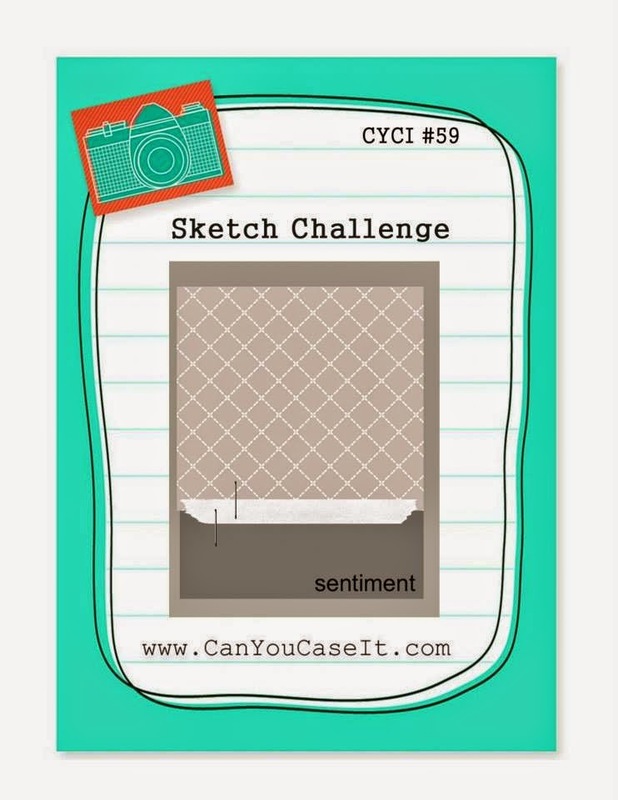 Today I Am The Guest Designer Over At "Can You Case It?" I was asked by my friend Eva, who I met through my friend Justin, who I met through my friend Renee because I had been following him on Pinterest (whoa, long story. Sorry, I digressed). Anyway, Eva asked me if I would be a Guest Designer on her challenge blog called "Can You Case It?". I was honored to be asked and said "sure"..."no problem"..."I'd be honored"...blah, blah, blah. Then I found out that I wasn't really "casing" something already made. I was given a "sketch" to "case"! So I sat myself down and had a little conversation with myself. I told myself, "self, sometimes you just have to face your fears, face those things that make you squirm, and sweat, and put fear into your creative thought process". But I did it. And, I have to admit, it was a lot more fun than I expected. Maybe I be taking part in other sketches down the road. 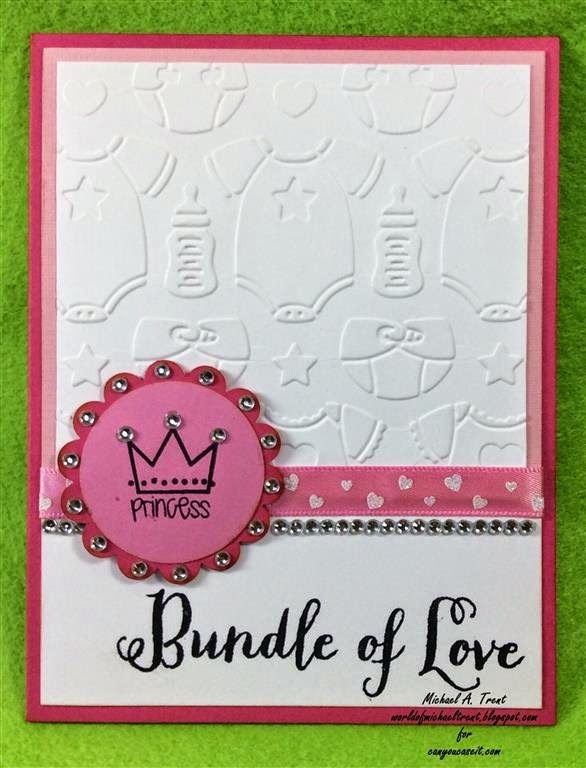 Since I was already in the middle of making some baby cards for a client and had all the supplies out on my table, I decided to make two of the baby cards using the sketch, Both cards are basically the same with the only differences being the embossing folders used and each card has a different "embellishment". You can see the 2nd card further down. Please note - I like to use Vintage Photo Distress Ink around the edges of all my pieces to make it blend nicer and make it look softer. This is optional! 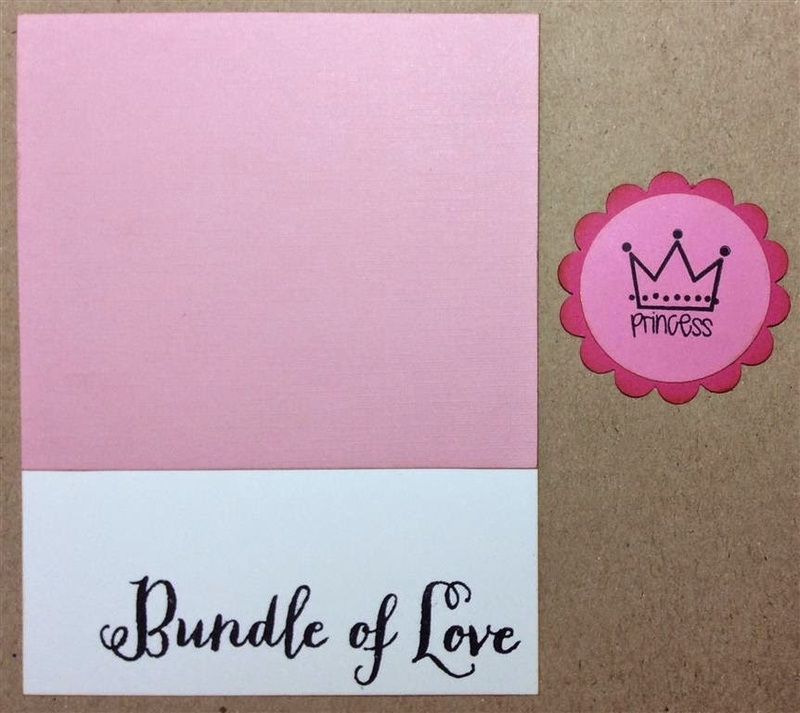 Start with an A2 sized card base of dark pink cardstock. Adhere a 4"x 3.5" piece of pink textured cardstock to the top of the 4"x 5.25" piece of white cardstock. 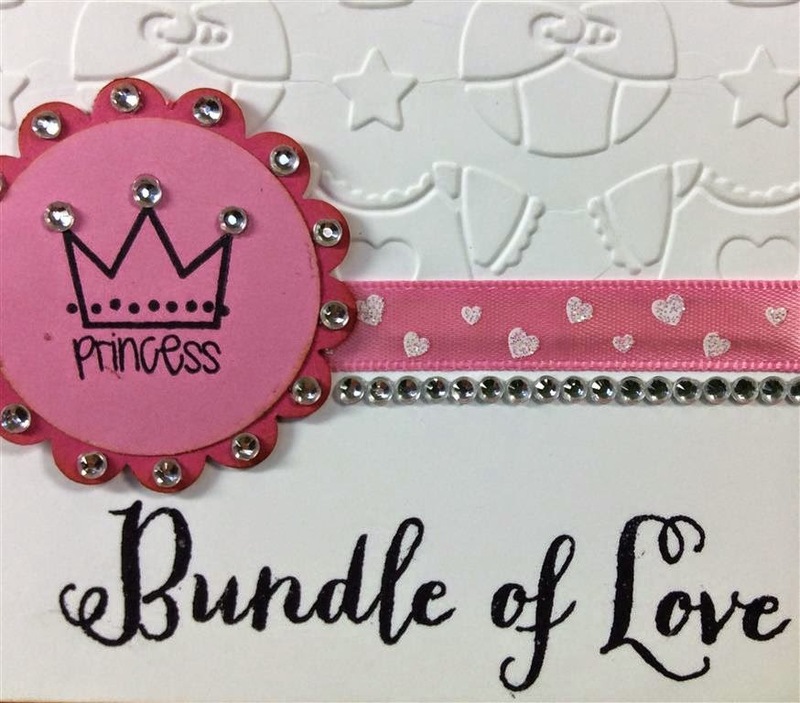 Stamp the phrase "Bundle of Love" with black archival ink (as close to the bottom as possible). 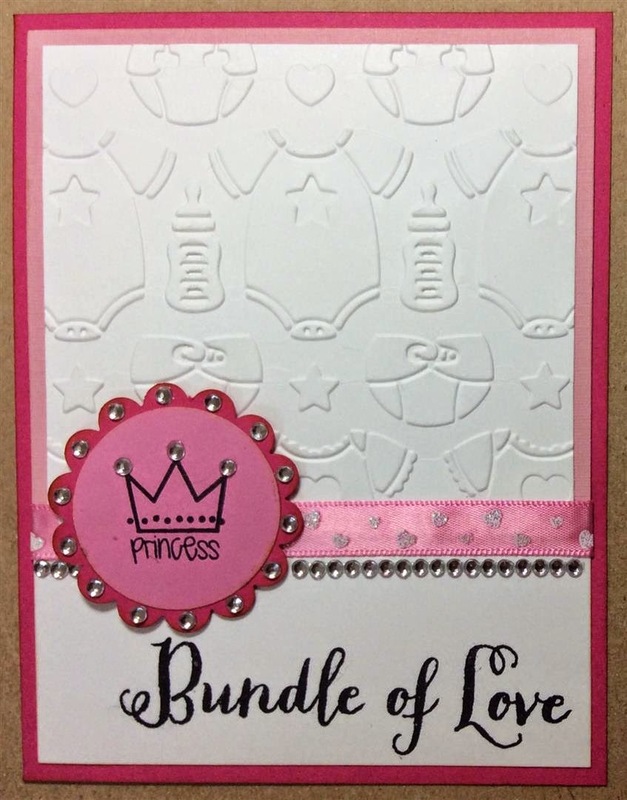 Stamp the crown with the princess phrase on the 1.5" pink circle. Adhere the pink circle to the scalloped circle and set aside for later use. 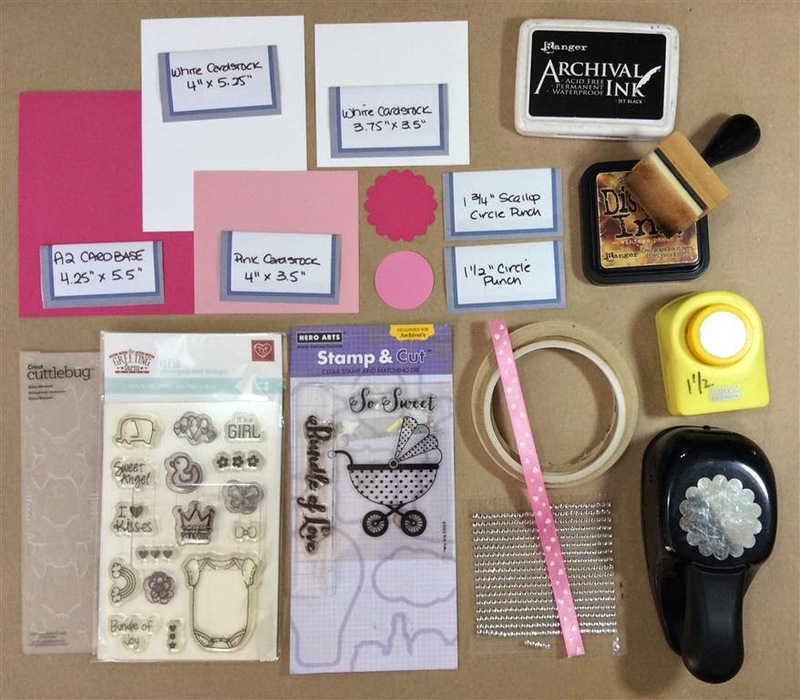 Place a piece of 3.75"x 3.5" white cardstock into the embossing folder in the exact position you want it to emboss. Run it through your die cut machine. Adhere it to the pink textured cardstock. The bottom will go over the pink cardstock but the ribbon will cover this. Apply some ribbon glue or other adhesive to the back of the ribbon and wrap around the card front - covering where the cardstocks meet. Then adhere this to the card front. Apply a crystal to each of the scallops and on the crown. Then apply some pop dots on the back of the scallop circle and adhere to the front left side of the card front. Then run a line of crystals under the ribbon. Don't forget any small spaces to the left of the scallop. 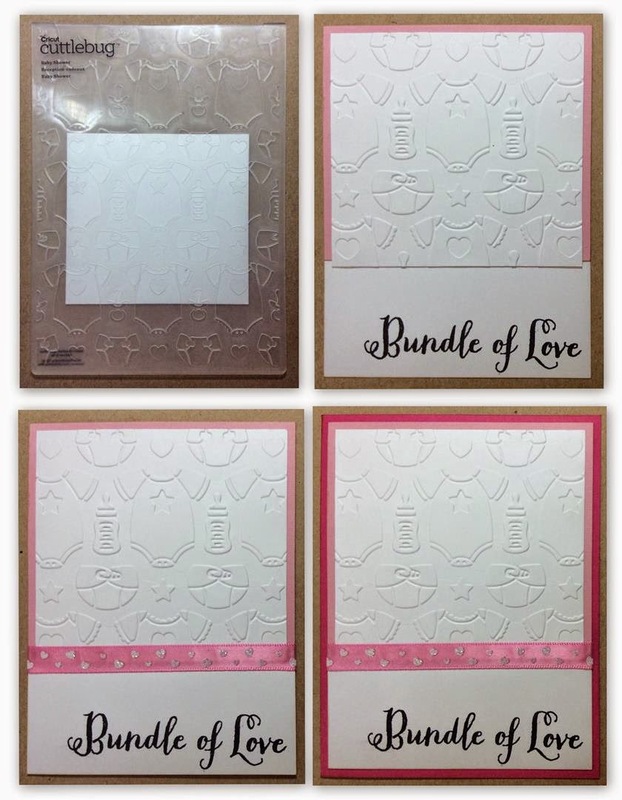 Now just adhere a piece of white cardstock to the inside - 4" x 5.25" and give to that special someone or mommy (or daddy) to be! Here is the other card I made. 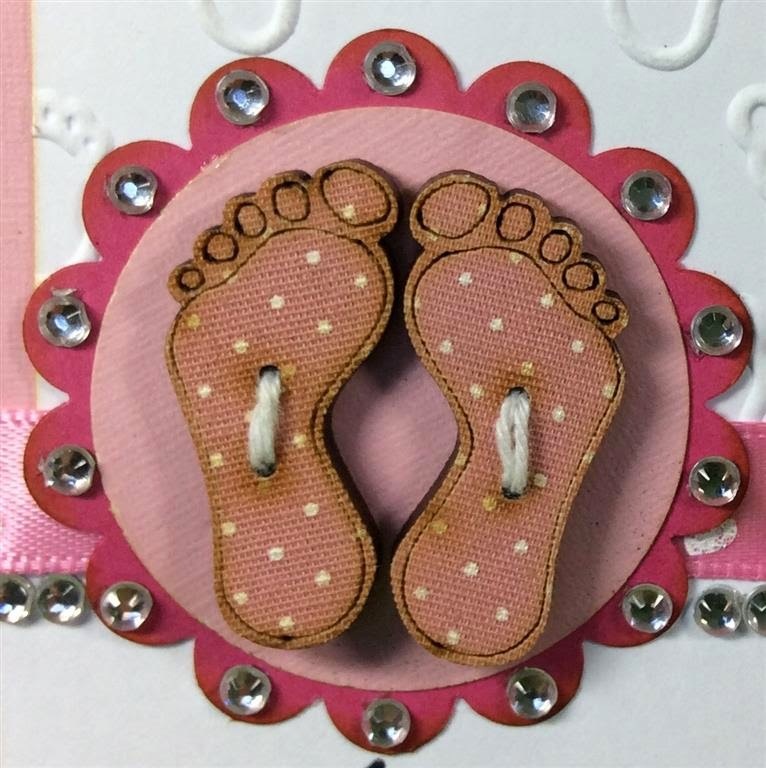 Also for a girl but this time I used an embossing folder by Crafts-Too called Babies Feet (CTFD4001) and I used some small wooden fabric covered baby feet buttons I get here in Brasil. So there you have my Guest Designer card(s) for the Can You Case It? sketch challenge for this week. Stop by the blog and see what the rest of the design team has done and show them some love by uploading one of your cards to the gallery! White Cardstock 3.75" x 3.5"
Pink Textured Cardstock 4" x 3.5"